We were nominated and shortlisted for two prestigious awards at the Peterborough Telegraph Business Awards 2016, held at the end of November. Celebrating the very best of business in and around the Peterborough and Cambridgeshire area, these awards are highly regarded in the industry and are a great way of showcasing everything that is great about business in the city. Having previously won the award for Small Business of the Year in 2011, we have been privy to the delight and sense of pride that comes with being an award-winning business. We have been working incredibly hard over the years, delivering the best in web development and digital marketing for all of our clients, so it was a pleasure to hear that we had been nominated for not one, but two awards this year. Shortlisted in the category of Small Business of the Year once more, we all felt proud of our achievements over the course of the last year. Our industry is not a small one, in fact, there are a number of digital marketing web development agencies in the area alone, and so we were honoured to have been recognised at this level. However, this time around, we were also nominated for another award: Young Entrepreneur of the Year. Our Managing Director, Azeem Yaqoob, set up i3MEDIA in his spare room just 12 years ago, and while the nomination was flattering, he was far too modest to believe that he could win. On the night, our team – usually found in hoodies and jeans – dusted off their finest and dressed to the nines in tuxedos and cocktail dresses; this was going to be a night to remember. 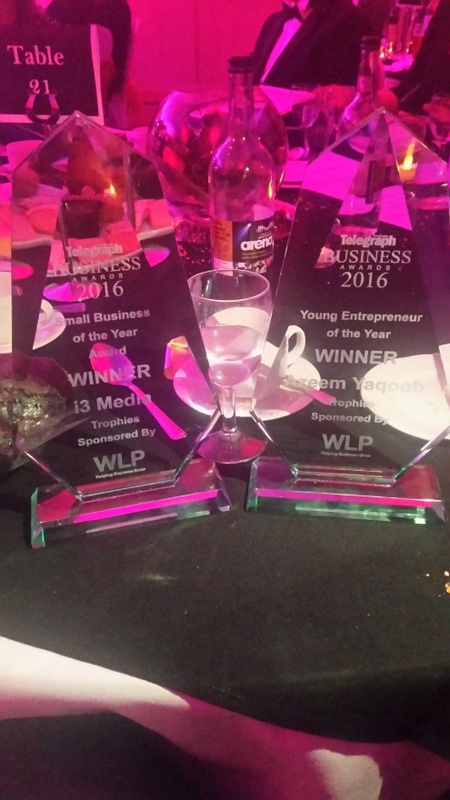 We are incredibly proud to announce that not only did we beat off the competition to take home the accolade of Peterborough’s Small Business of the Year 2016, but Azeem was also recognised for his efforts in steering i3MEDIA towards all the success we have achieved, receiving the Young Entrepreneur of the Year award personally. “It’s great to gain local recognition for the work we are doing to improve the visibility of businesses within Peterborough and Cambridgeshire, but I am delighted that the team has been able to pick up two awards on the night. Being recognised in such a way gives the team - and myself - the motivation to continue supporting local businesses in the way that we do. Of course, it’s not all about the winning – but it’s the sheer calibre of the work that we do that got us to this point. A great night was had by all, and we were all back in the office on Monday morning, ready to deliver the same high-quality work we know and love. Want learn more about the kind of work we do? Check out the rest of our website or get in touch about starting a project here.